Two starting days on the same day. The COLOSSUS at the World Series of Poker Europe in the King's Casino in Rozvadov saw its number of entries grow rapidly on Thursday. Here's what happened. 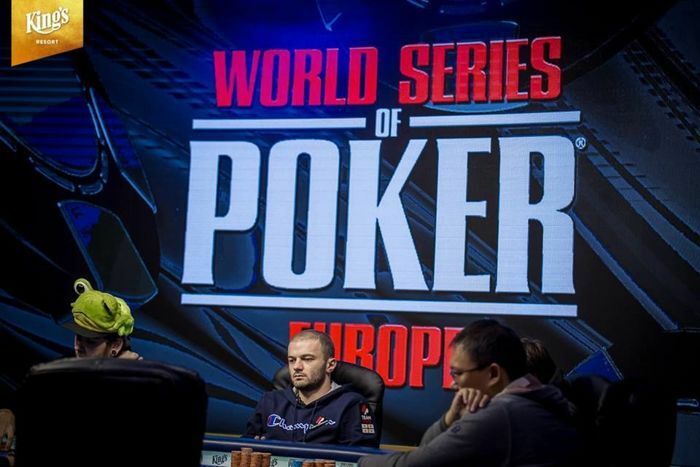 After 18 levels of play, the third of eight starting days of Event #1: €550 COLOSSUS No-Limit Hold'em during the 2018 World Series of Poker Europe in the King’s Casino was in the book. Day 1C attracted 125 entries for its first afternoon flight of the series. 12 of them managed to find a bag for Day 2. Daniel Prior (lead photo) takes the honor of being the Day 1C chip leader bagging 649,000 in chips, pipping Daniel Rezaei to the top spot. Rezaei tagged 623,000 at the end of a day where both of them were aggressively fighting to be on top. Josef Snejberg closes the podium with 527,000 in chips. Other notable players making it to Day 2 include Gaetan Cariou (212,000), Yunsheng Sun (173,000), and Alexander Bachmann (152,000). Alexander Shelukhin ended up being the bubble boy when he ran his ace-four into the ace-queen of Rezaei. Out of the 125 players, 19 of them would make the money, and seven of them busted before the end of the day, including Roland Israelashvili and Jan Bednar who collected €809 for their efforts today before jumping into Day 1d. The day was off to a slow start as the noon start might have been a shock to some of the players’ system as the previous two starting flights all started at 6 PM. Israelashvili was responsible for one of the first eliminations of the day when he called Thomas Wolf’s shove on the seven-ten-king flop with queen-ten. Wolf held ace-king, but Israelashvili managed to hit a straight on the river to send Wolf back to the cashier. Other players that failed early on in the day include Ronny Voth, Oliver Heidel, Kevin Paschmann, Timo Kamphues, Renato Kaneoya, Rifat Gegic, Anatolii Zyrin, Anson Tsang, Hannes Neurauter, Sander van Wesemael, Chris Ferguson, Philippe Bouhkin, Andrey Andreev, and Jakob Miegel. Bouhkin made a huge call to eliminate Sun on his first bullet when he called Sun’s shove on the jack-queen-four-trey-ten board with king-high. Sun had bluffed with seven-high. The half-way point was reached in the 2018 World Series of Poker Europe Event #1: €550 COLOSSUS No-Limit Hold'em, as four of the eight starting days have concluded at the King's Casino in Rozvadov. Day 1D attracted a field of 164 entries, of which the top 25 spots were paid, and the final ten players bagged up their chips with 19 minutes left in level 18. Jan Bednar claimed 633,000 to his name and is currently third in chips for all 51 players that advanced to Day 2 thus far, trailing Day 1A chip leader Dariusz Glinski (669,000) and Day 1C chip leader Daniel Prior (649,000). Quite remarkably, Bednar made it to the money in the earlier flight of the day and finished in 16th place out of 125 entries for €809 before jumping right back into the action. Several other notables are among the 10 survivors of Day 1D such as Flavio Decataldo (574,000), Bulgaria's Aleksandar Denishev (494,000), Philipp Zukernik (403,000), Oliver Heidel (393,000), Mick Heder (386,000), Jan Ramik (297,000) and Martin Kabrhel (291,000). The master of speech play, currently second in his country's all-time money list, already has one WSOP bracelet and four WSOP circuit rings to his name, all of which he won within the last two years right here at King's Casino. Kabrhel entered late and quickly scored a double up to get things started, then became one of the big stacks. Near the money bubble on the last three tables, he experienced a roller coaster ride and switched into push or fold mode. Rakesh Lalwani and Tomas Petru were among those that fell victim to this strategy. Other players that cashed but failed to bag up include Michal Lubas, Anson Tsang, Allen "Chainsaw" Kessler, and Marek Blasko. In level one, some 50 players were seated, and that number soon grew to more than 100 as all hopefuls eliminated from the previous starting day gave it another chance in the evening flight. Among those to bow out more than once were such notables as Roman Motovsky, Sander van Wesemael, Teun Kooij, Shaun Deeb, Roland Israelashvili, Timo Kamphues, Carlo Savinelli, and Michael Soyza. Six-time WSOP bracelet winner Chris Ferguson continued his late entry strategy but failed to capitalize on it as he busted before the money. Dutch Boyd experienced the same fate and further casualties before the money bubble included Aleksandr Merzhvinskiy, Jaroslav Peter and Andrea Klein. Hand-for-hand mode on the money bubble lasted all but one hand. Jan Ramik was fortunate enough to crack aces with pocket fives to survive, while Francesco Cirianni lost a flip with pocket jacks against the ace-queen of Mykhailo Gutyi to let the bubble burst. Three levels remained to be played for all remaining 25 players, and the all in showdowns kept coming at a rapid pace. Michal Lubas lost a big flip with jacks to ace-king, and Rakesh Lalwani missed his nut flush draw against the top pair of Martin Kabrhel. The elimination of Allen Kessler came in far more dramatic fashion, though. 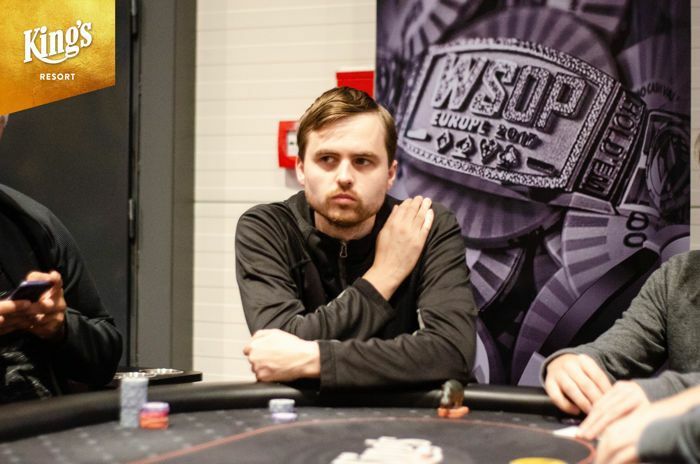 After a min-raise by Philipp Zukernik, Allen Kessler three-bet shoved for 12 big blinds and Michael Braeutigam mistakenly tossed in two chips out of the blinds to call Zukernik's raise. Braeutigam had to call off Kessler's shove with seven-six suited and cracked the pocket tens of the American poker pro by turning a flush and rivering a straight flush. 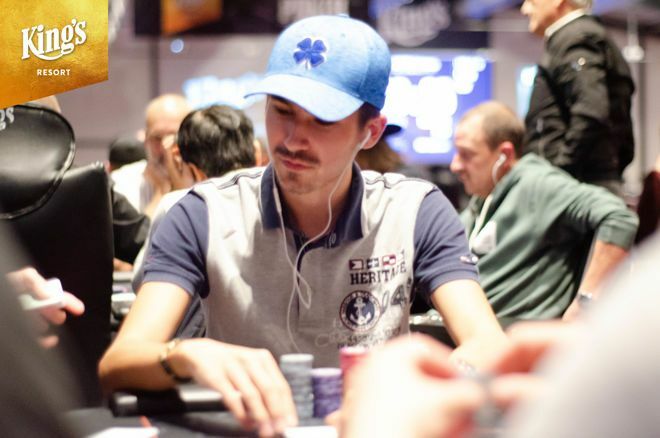 In the final two levels of the night, another nine players ran out of chips including Gutyi, Braeutigam, and Marek Blasko to reduce the field to the final 10. That's when the bags came out to end the day ahead of the planned schedule with 19 minutes remaining in level 18. So far, the event has generated a total of 610 entries, and 51 players have advanced to Day 2. Both numbers will rise significantly, as the two flights on Friday and Saturday are expected to fill Europe's biggest poker arena and put the tournament on track to surpass the guaranteed prize pool of €1,000,000. The PokerNews live reporting team will be on the floor from start-to-finish for all you need to know about the first chance to win a coveted gold bracelet during the festival. World Series of Poker Europe Live Reporting can be foud in the PokerNews Live Reporting hub.